The Aquarium's head veterinarian Dr. Charles Innis has a soft spot for turtles—even if they're big, cranky snapping turtles. 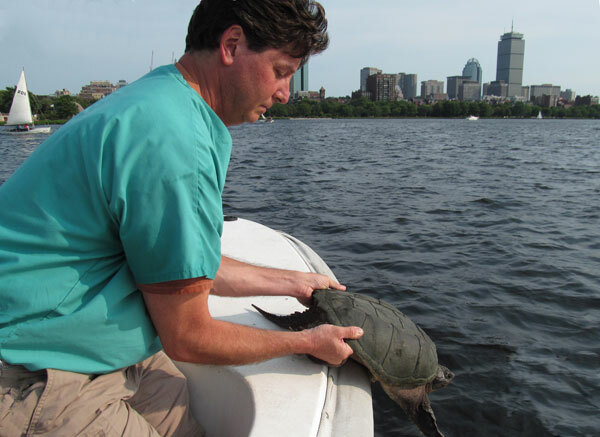 So it's no surprise that Dr. Innis jumped at the opportunity to help a hefty snapping turtle (Chelydra serpentina) trapped in the Charles River locks last Friday. New England Aquarium head veterinarian Dr. Charles Innis had his hands full with the careful relocation of a snapping turtle this week. The rescue effort started with a call from the supervisor of the Charles River Dam, Bill Gode, of the state's Department of Conservation and Recreation. The turtle was swimming near some moving mechanical parts of the lock's gates. Gode called the Aquarium because he was concerned that the turtle would be injured. 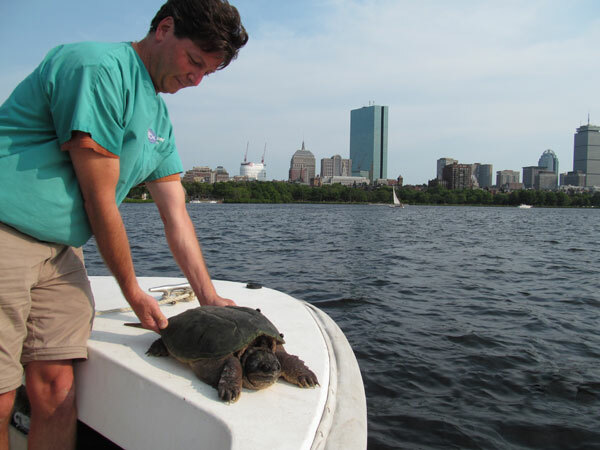 Dr. Innis released the turtle just upstream from the Longfellow Bridge on the Charles. Once on the scene, Dr. Innis caught the 20 pound turtle bare-handed from a boat provided by Constitution Marina. He then motored up the Charles to release the turtle. Interestingly, this snapper came in from the brackish water of the estuary and the inner harbor. Dr. Innis thought it might have come down from the Mystic River and was looking to reenter fresh water. Snappers can survive for extended periods of time in brackish water. Snappers can also deliver a serious injury if they are mishandled. With flexible necks and sharp beaks, their bites can be quite dangerous! So leave the relocation efforts up to the experts. But they are amazing creatures to observe from a safe distance. They can weigh between 10 and 30 pounds and you can usually find them in shallow ponds, lakes, river and streams. You can sometimes see them basking at the water's surface, however they can also nestle into shallow water only poking their heads up to breath. It's not the first time the Aquarium has been called to help with a rescue effort at the locks. Learn more about a wayward harbor seal that once wandered into the Charles in October 2010. Dr. Innis has also traveled across the country to help marine animals during the Gulf Oil Spill. If you're interested in animal rescue efforts, be sure to join us for a live webcast with sea turtles patients rescued from Cape Cod in Fall 2011. This very special event will happen this Wednesday at noon EST. Bookmark this page and tune in with your questions for the rescue team! So proud of animal lovers like Dr. Innis!